A phyllo dessert that is just Heavenly! 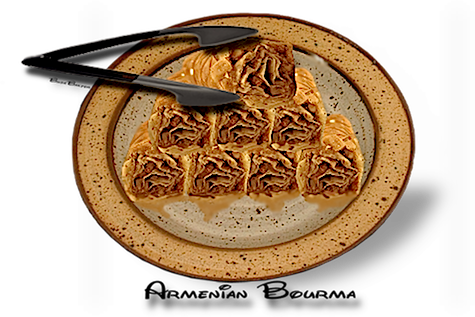 Very similar in taste and texture as baklava, but in a rolled form. It is loaded with walnuts, lemony syrup with cinnamon and maybe a touch of rose water. cookie sheet and butter or cooking spray. 2. Mix nuts, sugar and cinnamon together and set aside. the first and brush with butter. 4. Evenly spread 1-2 tablespoons of filling mixture across the center ⅓ of the sheet. 7. Brush the butter over the dough and then bake in a 350°F degree oven until light golden brown on top. 8. Take the bourma and cut into 3 in. pieces. 9. To serve,  drizzle warm sugar-lemon-honey syrup over the top. 1. Combine the sugar, honey and water and cook for 10 minutes. Add lemon juice and cook for 2 minutes.